Ever since Disney bought Pixar Animation Studios in 2006, the family entertainment behemoth has lived a dual life when it comes to its computer-animated features. The more ambitious features were handled by Pixar, whereas the more traditional all-ages fare has remained in-house. Yet this simple dichotomy has become increasingly meaningless as Pixar’s once unshakeable quality has deteriorated and Disney’s own computer-animated films have acquired new relevance. Cars 2 and 3, Monsters University, Finding Dory, and The Good Dinosaur failed to capitalize on the nuances that made the first wave of Pixar films so great, just as the Disney-produced Wreck-It Ralph, Zootopia, and Moana seemed to take over the torch of quality animation. Disney’s Ralph Breaks the Internet is further evidence of the corporation shifting its priorities. It’s a clever and charming sequel that surpasses the original, despite occasionally feeling like an infomercial for Disney’s intellectual property acquisitions. The film opens to the stasis achieved at the end of the first movie. Wreck-It Ralph, (John C. Reilly) a nine-foot-tall havoc-maker, spends his days as a video game antagonist, but when the arcade closes at night he’s able to move about and socialize with other members of the arcade’s games, including Vanellope (Sarah Silverman), the pint-sized leader of a candy-themed racing game. Ralph is happy with his routine, but Vanellope is jonesing for something fresh; the sugar-coated racetracks she zooms down have grown old. Thinking he’ll create something new and exciting for her, Ralph paves a new track for her race, which unintentionally damages Vanellope’s game. Thanks to a newly installed WIFI connection, Ralph and Vanellope are able to transport themselves to the vast playground of the internet in hopes of finding a replacement for her game before it’s junked. But a lot has changed in the last few decades, and the internet has replaced arcades like Ralph’s as the home for most major games. While searching for the replacement part, Vanellope finds a game called Slaughter Race, a Grand Theft Auto-style parody that so dark and dangerous that great white sharks inhabit its sewers, randomly popping out of manholes to devour frothing pit bulls. The new games dangerous adventures are far more appealing than the candy-coated racing she’s used to. As Ralph desperately tries to acquire the part to save Vanellope’s game, it’s not even clear if she wants to go back. 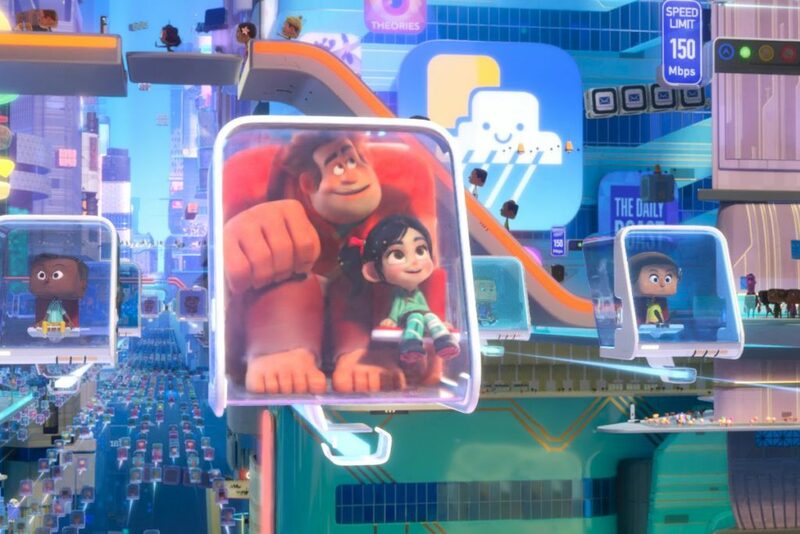 Wreck-It Ralph ingeniously fused the 8-bit animation of ‘80s arcade games with Disney’s more nuanced style, but Ralph Breaks the Internet surpasses it in ambition with its depiction of the internet as a global gathering place. Ralph and Vanellope interact with little blockheaded avatars of humans logging onto the internet. Spammy pop-ups are represented by obnoxious hucksters waving clickable signs that will whisk these avatars away from their intended sites to buggy timesucks. Bill Hader (strangely uncredited) is excellent as a helpful but misguided pop-up who introduces Ralph to shadier denizens of the dark web who can help him acquire the necessary spare part. The Disneyfication of these aspects of culture has its pluses and minuses, but of course, we’d only see the pluses in a film produced by Disney. When Ralph and Vanellope visit eBay to find the part, they walk in on a literal auction house, with millions of avatars bidding on random items. Ralph and Vanellope, not versed in the ways of the world, don’t understand the strategy behind auctions, and just start shouting out ever larger numbers, until they owe thousands of dollars for something worth a couple hundred at most. The film’s internet design, while quite literal, also seems like the only logical way to convey such a large and unwieldy concept. The movie’s creators could have easily chosen to create some kind of Warcraft-like fantasy realm, but they picked the right approach by avoiding that kind of romanticism. Once thought of as a place of endless possibilities, anyone who spends much time browsing Facebook or Twitter knows just how limited the internet really is. The more conservative internet design also benefits the film in visual terms. Many of the best computer-animated movies try to be as colorful and bombastic as possible, which ends up desensitizing the viewer. Instead, Ralph Breaks the Internet creates textures we haven’t seen before. Slaughter Race exists in a hyper-smoggy apocalyptic parody of Los Angeles that’s perpetually at dusk. We’ve seen live-action films attempt things like that, but no one with the limitless options of animation has tried it before. The film’s story doesn’t attempt to be revolutionary either, but it subtly tweaks the beats we’ve come to expect. The film’s external conflict is wrapped up surprisingly early, revealing a deeper, more internal conflict. There’s a villain, but it’s not at all what we might expect. These are small tweaks, yet they feel immense. John C. Reilly (a great actor) and Sarah Silverman (an undervalued actor of great talent) help convey the film’s emotional weight more effectively than many of the celebrities that anchor these big budget computer-animated films. 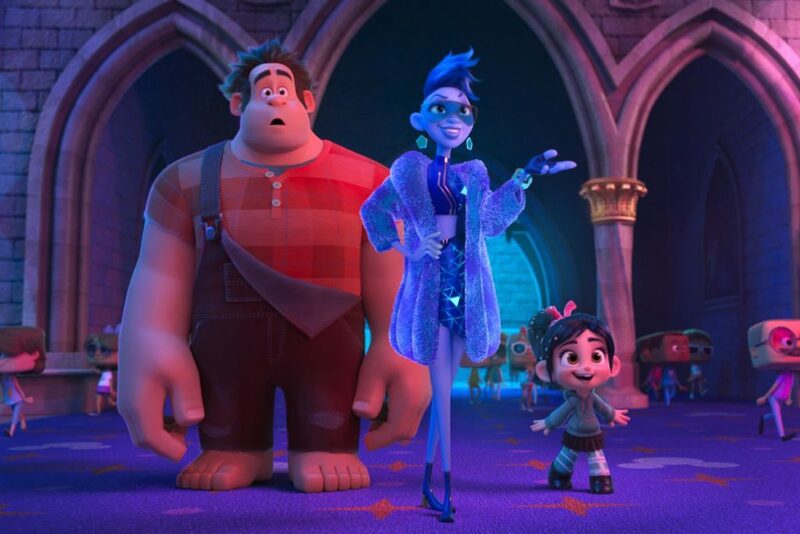 As great and enjoyable as much of Ralph Breaks the Internet is, those who are wary of the role of corporations in our lives might have reason to pause before seeing the film. Disney has filled its fantasy version of the internet with many of the real tech giants that shape our society: Google, Amazon, eBay, YouTube. It says little about most of them, but we’re led to believe from all the smiling avatars that these are forces for good, and the eBay scenes read like an advertisement for the site. But things are more complicated when Vanellope happens to find Disney’s own part of the world wide web. These scenes, though fun, seem tailored to show off all the franchises Disney has purchased in recent years — Disney princess frolic with their Pixar cousins, while stormtroopers play security and Iron Man and Groot show off for adoring fans. The Disneyfication of these aspects of culture has its pluses and minuses, but of course, we’d only see the pluses in a film produced by Disney. 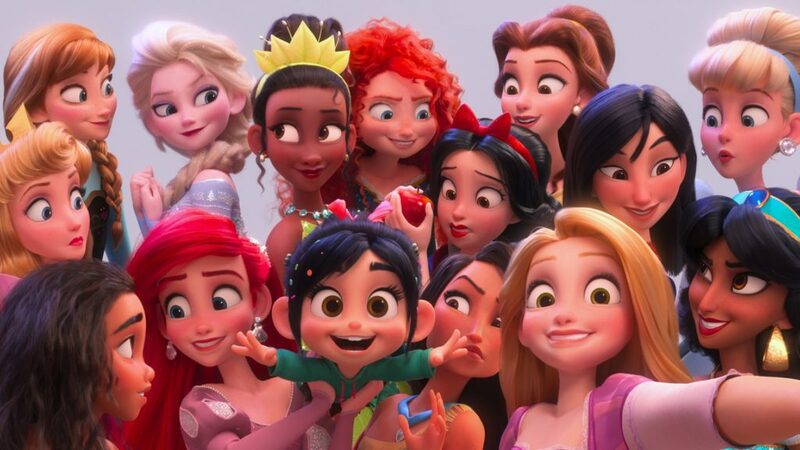 The movie tries to have it both ways in a scene where all the Disney princess complain about the retrograde gender beliefs of their films, even though there’s a non-zero chance those same retrograde beliefs will be represented in whatever Disney princess film comes next. As hard as it is to look past this weird corporate shilling, Ralph Breaks the Internet still manages to be a clever and moving sequel to the original. The movie builds on the original in subtle yet meaningful ways. It doesn’t try to reinvent the wheel, but it does make it better.